The IBM EXP400 (Type 1733) expansion enclosure allows you to add up to (14) Super Slim-Line (SSL) U320 SCSI disk modules to your xSeries server using ServeRAID 4, 5, 6, and 7 Series controllers. The EXP400 offers dual U320 link control cards (ESMs) with VHDCI U320 connectors. The EXP400 can operate in two different modes. In the full mode, 14 drives are seen by each ESM which is ideal for cluster environments. 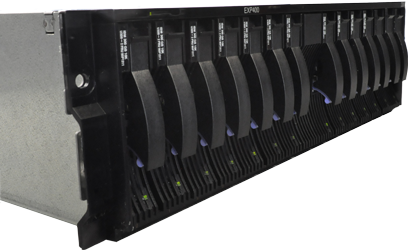 Alternatively, in split-bus mode, each ESM sees only 7 drives which is ideal for using only one enclosure among two servers. See the installation guide on the left side bar to switch between full and split-bus mode. Learn how to attach an EXP400 to a ServeRAID SCSI Controller in order to expand the storage capacty of x336 servers.